The endangered sea turtle emerges from its nest and dashes to the sea. So begins an odyssey that will take the hatchling on a several thousand mile and decades-long migration, ending in its return as a giant adult to the very beach where it began life - completing a cycle that has endured for 100 million years. The modern world poses many threats to ancient sea turtles: poaching, entanglement in fishing gear, destruction of nesting sites, and pollution of the oceans. 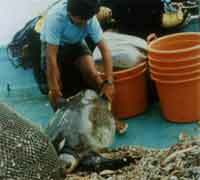 The greatest threat comes from the capture of sea turtles in shrimp nets. As the public's taste for shrimp increases, so does the danger to sea turtles. Turtle excluder devices (TEDs), installed in shrimp nets, offer the simple solution. If the public demands "turtle-safe" shrimp the way they do "dolphin-safe" tuna, then the industry will be forced to use TEDs consistently. "Environmental studies and science classes will find this an essential aid in their consideration of current environmental events." "The high-quality film documents the threats facing sea turtles and educates viewers about the urgent need to protect these endangered creatures... an effective educational tool for legislators and others." "An overview of human impacts on the survival of sea turtles...illustrates the complexity of the problems, and provides insight into why solutions are neither easily devised nor implemented. Suggests concrete avenues for improvement...Leaves the viewer with a realistic by hopeful outlook." "Makes room for discourse on a variety of levels, inevitably leaving the viewer with the realization that we must evaluate our lifestyles and our priorities." "Well crafted, balanced and well edited...I recommend this video very highly."